Mount B recorded a 109-run win over Southowram in the Halifax League Second Teams Division One last Saturday. Mount elected to bat but struggled to 50-3 before a partnership of 100 between Mohammad Makda (61) and Jabir Patel (81) got them back on track. Tailender Javid Patel struck 44 not out late on to boost the Mount total to 265-5. Southowarm batted well but fell short as they were restricted to 156-7 as Makda and Abdul Patel both picked up two wickets a piece. 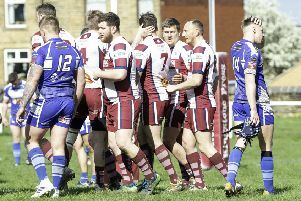 Mount B were knocked out of the Crossley Shield quarter-final by Illingworth on Sunday. Amjad Hussain (34) top scored but Mount were bowled out for 170 by the former Airedale and Wharfedale League outfit. Sirak Patel claimed 2-11 in reply but Illingworth went on to seal a five-wicket win. Mount A’s Division Two game against Luddendenfoot was abandoned at tea following a heavy downpour, which left the ground waterlogged. Mount A won the toss and elected to bat in the top of the table clash but it was the Luddendenfoot opening bowlers who began well to reduce the home side to 26-3. Anees Rawat and Ismail Mayet (26) produced a 70-run partnership. Rawat then shared another decent stand with Hanif Kayat (28) before a mix-up saw the former run out for 60. Imran Ravat produced an excellent knock of 65 under pressure and with the help with the help of Imran Rawat (29) and Zahoor Munaf (26) they helped Mount reach 282-9 from their 45 overs. The heavens opened wiping out the chance of any further play but the extra bowling point Mount earned was enough to move them top of the table.